I can't help it - when I think of Mof I must think of Frik du Preez. They were bosom friends - inseparable and always up to something or other. Their ability to mimic Charles Fortune giving a cricket commentary was absolutely priceless. On the field Mof always carried a lot of weight. It must have been terribly difficult to move about with the amount of weight he carried, but carry it he did. Many was the time that he was able to save South Africa in test matches, purely because of his strength. A loose-head prop has a very difficult task at the best of times but with his immense power Mof Myburgh could take on anybody. 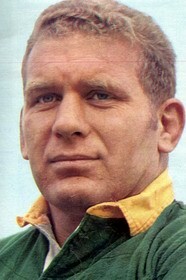 His support in the line-outs gave the Springboks a major advantage throughout his career.